Many people are now starting twitter accounts and are starting to enjoy this fast paced conversation with people from just down the road or across the globe. But how do you write a good tweet? One that will start a conversation or get re-tweeted and seen by thousands? 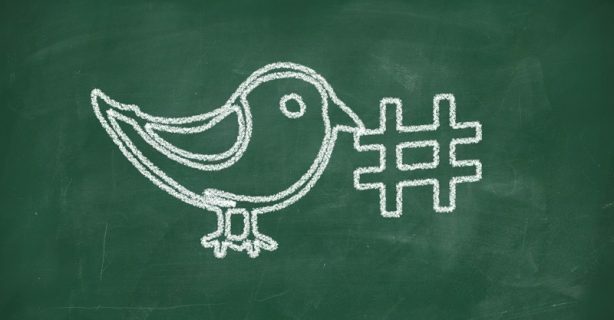 Two key elements to good tweets are hashtags (#) and tags (@). Here are our top tips for using them. Twitter lets you know what words are trending at any given time in the left side bar. 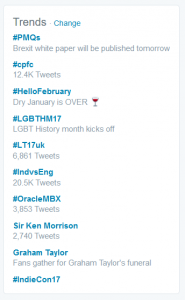 These are mostly #words and it is great to tweet with a hashtag when it is already trending. Always worth looking at what is currently trending to see if you are inpired to join in the conversation. It can be good to search on a hashtag before using it so that you know how and who is already using it out there. I found a lovely one the other day; #YellowMonday for positive Monday morning comments. Tagging in twitter is when you mention someone by their twitter name (e.g. @CoastalVAs). If you mention someone in a tweet and tag them they will see your tweet in their Notifications tab on twitter. This is a great way to make sure someone sees your tweet about them. It is also a plus for the person being tagged as you are sharing their account name to your followers. If they like your tweet, it will also be far more likely that they will re-tweet you if you have tagged them. The trick with tagging is to make sure you get the right account! It is best to search twitter for the person you want to tag, go to their account and make sure it is the right person and then highlight and copy their twitter @name. 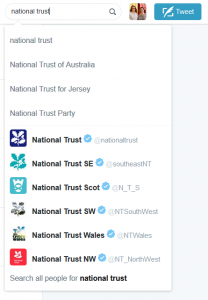 This may seem simple, but we recently wanted to tag the National Trust as we had enjoyed a great day out at one of their locations. 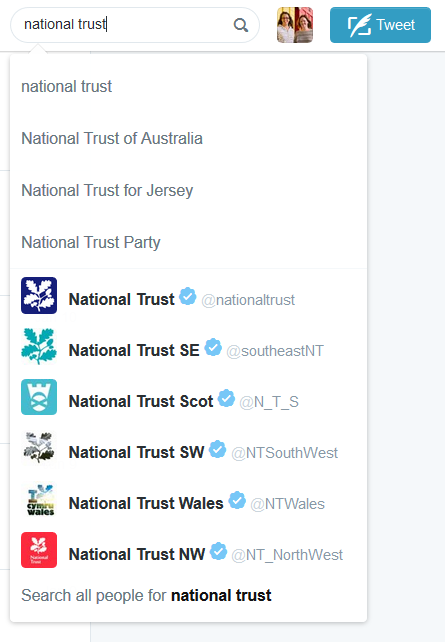 On searching twitter we found there were more than one National Trust twitter account. Which do you pick? The best idea is to visit the accounts and see which is nice and active and is talking about your area. If in doubt, you can visit a company’s website and see if they list their official twitter account there. Now you know the difference between your # and your @ you can feel confident to tweet away. The rest of good tweet writing is down to your own creativity and sense of humour. Have a bit of fun with it and enjoy the ride.